Haworth was a visionary and a pioneer in the face of the American feminist movements of the 1960's through challenging gendered stereotypes through her artworks while emphasizing the importance of having a female identity through her works that emphasized iconic female symbols in her soft sculptures. Haworth refused to let her male peers intimidate her and diminish her success. In the 1970s, she and Blake were members of the Brotherhood of Ruralists, a group of artists that also included Ann and Graham Arnold, Annie and Graham Ovenden, and David Inshaw. In 1979 she founded and ran The Looking Glass School near Bath, Somerset, an arts-and-crafts primary and middle school. In the same year, she separated from Blake and commenced living with her present husband, the writer Richard Severy. During the subsequent two decades, her artistic career took second place to her commitment to raising a young family (two daughters, three stepdaughters, and a son). Still, she found time to illustrate (as Karen Haworth) six of Severy's books: Mystery Pig (1983), Unicorn Trap (1984), Rat's Castle (1985), High Jinks (1986), Burners and Breakers (1987), and Sea Change (1987). She also created five covers for the 1981 Methuen Arden Shakespeare editions of Richard III, Macbeth, Twelfth Night, Henry the Fifth, and Coriolanus. Haworth also authored three "how-to" art books for children: Paint (1993), Collage (1994), and Painting and Sticking (with Miriam Haworth, 1995). After mounting two solo exhibitions at Gimpel fils, London, in the mid-1990s, Haworth won a fellowship in 1997 to study American quilt-making. She returned to the United States and took up residence in Sundance, Utah, where she founded the Art Shack Studios and Glass Recycling Works, and co-founded the Sundance Mountain Charter School (now the Soldier Hollow Charter School). Since then, her career has exhibited in solo exhibitions at the Mayor Gallery, London (2006), Wolverhampton Art Gallery (2007), and Galerie du Centre, Paris (2008). She also has been represented in numerous Pop art retrospectives, including "Pop Art UK" (Modena, 2004), "Pop Art and the 60s: This Was Tomorrow" (London, 2004), "Pop Art! 1956-1968" (Rome, 2007), and "Seductive Subversion: Women Pop Artists, 1958-1968" (Philadelphia, 2009). 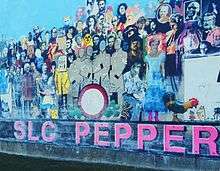 In 2004, Haworth began work on SLC PEPPER, a 50-foot × 30-foot civic wall mural in downtown Salt Lake City, Utah, representing an updated version of the Sgt. Pepper's Lonely Hearts Club Band album cover. As Haworth stated, "The original album cover, famous though it is, is an icon ready for the iconoclast. We will be turning the original inside out... ethnic and gender balancing, and evaluating for contemporary relevance." Together with over thirty local, national, and international artists of all ages, Haworth created a new set of "heroes and heroines of the 21st century" in stencil graffiti, replacing each of the personalities depicted in the original. Only the Beatles' jackets remain as metal cut-outs with head and hand holes so that visitors may "become part of the piece" by taking souvenir photos. The first phase of the mural's construction was completed in 2005. SLC PEPPER remains an ongoing arts project, where local artists will continue to add to its design. Among the over 100 new people selected for SLC PEPPER are: Adbusters, Akira Kurosawa, Alice, Alice Walker, Annie Lennox, Banksy's Rat, B.B. King, Beastie Boys, Benicio del Toro, Billie Holiday, Björk, Bob Marley, César Chávez, Charlize Theron, Cindy Sherman, Dalai Lama, David Bowie, David Hockney, Ellen DeGeneres, Erykah Badu, Eudora Welty, Enid (Thora Birch), Eve Ensler, Felix the Cat, Frank Zappa, Frida Kahlo, Garrison Keillor, Gandhi, Mikhail Gorbachev, Gore Vidal, Guerrilla Girls, Harvey Pekar, Hedwig, Howard Zinn, Jackie Robinson, Jane Goodall, Jean-Michel Basquiat, Jeff Bridges, Katharine Hepburn, Laurie Anderson, Lee Krasner, Louise Brooks, Martin Luther King, Jr., Maya Angelou, Maya Lin, Miles Davis, Mother Jones, Muddy Waters, Nelson Mandela, Pablo Picasso, Peter Gabriel, Robert Rauschenberg, Ray Charles, Richard Feynman, Rosa Parks, Samuel Beckett, Sylvia Plath, Sojourner Truth, Terry Gilliam, Tom Waits, Thom Yorke, Toni Morrison, Tony Kushner. ↑ Christopher Finch, Jann Haworth: Artist's Cut [exh. cat], Mayor Gallery, London, 2006. ↑ Marco Livingstone, Jann Haworth: Artist's Cut [exh. cat], Mayor Gallery, London, 2006. ↑ Penrose, Roland (1963). 4 Young Artists (exhibition catalogue). London: Institute of Contemporary Arts. ↑ George Martin, Summer of Love (1994), pp. 114–116. ↑ "SLC Pepper: Heroes and Heroines of the 21st Century"
Pop Art: An Illustrated Dictionary by Jose Pierre (1977, Eyre Methuen).